[CLOSED] Win 5 Nikelodeon Kids' Choice Awards Hoodie Here!!! Hi mommies and kids! Are you excited to know the winners for this years Nickelodeon’s Kids’ Choice Awards? If you're a fan of Nickelodeon, I'm pretty sure that you cannot wait the excitement as the Nickelodeon’s Kids’ Choice Awards premieres on Nickelodeon in the Philippines next Monday. It’s that slime of the year again! Come 12 March, the ultimate celebration of all things kids love –Nickelodeon’s Kids’ Choice Awards will return with massive musical performances, colossal celebs and super-sized (possibly slimy) surprises! The show will premiere in Philippines on Monday, 14 March at 11:30a.m. and repeat on the same day at 6pm. In anticipation of the most slime-tastic time of the year for kids around the world, we’ve put together a list of fascinating facts about the Awards. For starters, did you know Nickelodeon’s Kids’ Choice Awards is the only awards show that gives kids the power to vote for their favourites in movies, television, music, sports and much more -- and honors their opinions with a live show filled with the stars they love? As you read on, just remember one thing –it’s kind of a big deal! 1. That time when Nickelodeon’s Kids’ Choice Awards was born. 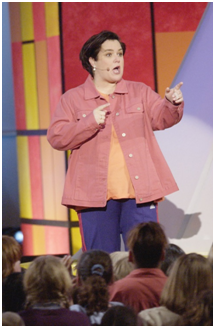 The show concept stemmed from Nickelodeon’s research with kids, which found that kids wanted to feel like they made a difference in the world. Kids wanted to be heard. So in 1986, Nickelodeon created Big Ballot, the first national poll of kids likes and dislikes. The Big Ballot was eventually renamed Nickelodeon’s Kids’ Choice Awards in 1988. Win 5 Nikelodeon Kids' Choice Awards Hoodie Here!!! 2. That time when there was an actual use with the famed Nickelodeon’s Kids Choice Awards award. The hollow orange blimp figurine handed out at the Awards also functions as a kaleidoscope. Check it out HERE. 5. That time sports stars got slimed too. 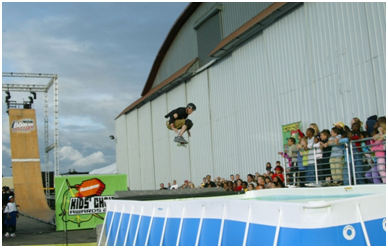 In addition to winning Favorite Athlete at Nickelodeon’s Kids’ Choice Awards in 2003, skateboarding champion Tony Hawk went for the green - clinched a record – wowed the crowd with a spectacular "World Record Skateboarding Slime Dive," after landing in an 11,000-gallon/41,600-litre tank of Nickelodeon's signature green slime. 6. That time Will Ferrell held the world record for the longest ‘Slip n’ Slime,’ slipping through 200 feet of the green goop at the 2009 Awards. 7. That time Orlando Bloom and Jack Black set the record for the longest sliming, getting showered with green goo for one whole minute at the 2008 Awards. 8. That time we broke all rules and slime was not green! In 2002, multi-platinum recording artist Pink became the first person in the history of the Awards to be slimed with non-green goo. It was pink! This was before David Beckham and his sons Romeo and Cruz were slimed with gold-colored slime for the first-ever Nickelodeon Kids' Choice Sports Awards in 2014. 9. This year’s Nickelodeon’s Kids’ Choice Awards is hosted by The Voice star and country music producer, Blake Shelton. Voting has begun across all platforms and guess what? 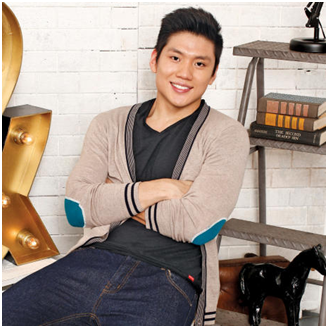 Representing the country in the Favorite Asian Sports Star category is La Salle basketball player Jeron Teng. Vote for him via kca2016.com or tweet #VoteJeronPH #KCA. 10. 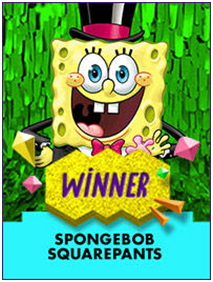 That time when SpongeBob SquarePants became the most decorated sea creature of all time, having won 14 awards to date, with 12 wins for Favorite Cartoon and two wins for Favorite Video Game. 1. Comment below who will you vote for and why? 2. Comment together with your full name and email address. 4. Winners must claim their prize at STRATWORKS, 2nd Floor Zaragoza Bldg., 102 Gamboa St. Legaspi Village, Makati. C;aiming of prizes is from Monday to Friday only from 10 am to 5 pm. Good Luck to all joining! 1. Maine Mendoza - Because she inspires the youth. She's kid at heart, a really good example and adored by kids. My vote goes to Mr. Enrique Gil because he is so talented,down to earth and he is so family oriented person. He's very friendly not only to his friends but most especially to his fans and supporters. I voted for Maine Mendoza because she makes everyone in the house happy. I'm voting for Maine Mendoza because beside for making me so happy when i watch her at kalyeserye,she's indeed a role model,she graduated with honor but manage to be down to earth person,and she always loves her craft and thankful to those people who support her all through out her blooming career! I would vote for Maine Mendoza because she has shown nothing but good morals and good attitude towards everyone. She is a good example to the youth today simply by being herself with good guidance of the "lolas." My kids also love her. I'd vote for Maine Mendoza. I'm not exactly a fan. But among the nominees, I think she's gotta be the best choice. Kathryn was reportedly "kicked out " of Iglesia Ni Cristo, (Kathryn's church) because she's endorsing presidential candidate Mar Roxas (and it's against their INC faith), Enrique was subjected to an unruly behavior while inside an aircraft. So I think Maine is the only good choice. I'm voting for Maine Mendoza because my daughter likes her very much! The enjoyment that we had while watching her and the whole gang takes all our stress out. My vote goes to JAMES REID. Why? Because aside from his handsome face, he's also a multi talented artist. He can dance, he can act, and he can sing, his voice is music to my ears. He deserves it because he's a hardworking person and I want to see him slimed! I vote for Ms. Kathryn Bernardo. For me, she's deserving to win. She's a nice person. Aside from being beautiful and being a good actress, she also set as a good role model or a good example for every youth. Despite of her popularity, she remain humble and down to earth that makes people love her more. Maine Mendoza surely has my vote. Looking at the values, confidence and self-worth that each nominee possesses, I admire the simplicity of Ms. Maine Mendoza. Don't get me wrong. I am not a fan. But her stardom, somehow, promotes that you can be in the spotlight without being covered with too much aesthetics and by being true to yourself. Her quirkiness led her to where she is today, but her humility kept her in that position. She herself is a brand - a masa brand, but she still shows inclusivity and sophistication.